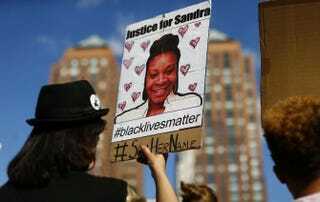 A woman holds a poster bearing the portrait of Sandra Bland, a 28-year-old black woman who died while in police custody in Texas, during a memorial rally in New York Aug. 9, 2015, for Michael Brown, the unarmed teen killed by police in Ferguson, Mo. My name is Sharon Cooper, and I am Sandra Bland’s sister. This has been a very difficult time for my family. Since Sandra’s death, we have been in mourning, but candidly, our ability to mourn has been paralyzed by the unusual and unsettling circumstances surrounding her death. That is why I am writing to you. My sister Sandra, affectionately known as Sandy, was a vibrant, outspoken and intelligent 28-year-old who was absolutely full of life. I stand in awe of her. I’m proud of her. And I celebrate her as my sister. The week before she was pulled over for not signaling a lane change, Sandy and my mother, Geneva Reed-Veal, enjoyed a family trip that saw Sandy’s excitement and zest for life soar. On the heels of that amazing family trip, my family and I have been expected to believe that Sandy suddenly experienced an emotional breakdown over three short days that led up to her death. She was thrilled about her new job, which is clear in a number of voice mails she left for me and my mom. You can hear the excitement in her voice. Our confidence in the local investigation to date has been shaken by numerous inconsistencies. Our family has been given limited information about the case, while Waller County, Texas, jailers have had unfettered access to the crime scene. Almost everything we know about what happened to my sister has come from the media, not the prosecutor’s office that is responsible for helping to ensure justice for my family. It is hard to describe the frustration of these past two months. Texas State Trooper Brian Encinia has yet to be fired or prosecuted, despite an infuriating video that shows him violently arresting my sister, which he later denied in a falsified police report. My sister shouldn’t have been stopped or arrested in the first place. She was pulled over for a petty, routine traffic issue and should have been sent on her way. Instead, Officer Encinia felt his ego was bruised and decided to escalate rather than de-escalate the situation. Furthermore, pre-existing professional ties among officials leading the investigation into her death reveal serious conflicts of interest that prevent a fair and independent investigation. Waller County Judge Carbett Duhon III held a press conference with Waller County District Attorney Elton Mathis where they released disparaging information about Sandy in an effort to sully her name. We were forced to file our civil suit in federal court because we were too troubled by the above and multitude of questions we still have even months after Sandy’s death. On behalf of my family, I ask you to take action. You have the power to bring together the necessary resources to find the truth and investigate Sandy’s death as well as the ongoing problems in Waller County and Texas that led to her death. Unless you take action, it’s likely my family will be denied the justice we deserve and the people of Texas will be denied the change they deserve. Sandy’s death is part of a much larger problem of discriminatory policing and unjust incarceration targeting black women across America. As we have seen in response to her death and the use of hashtags like #JusticeForSandy, #SandySpeaks and #SayHerName, the country is ready for change. And that change starts—but doesn’t end—with accountability for law-enforcement and justice officials who do wrong. My family has been forced to pay the ultimate price for the deep-seated racial discrimination and corruption in Waller County and the Texas Department of Public Safety. Our family is going to do everything in our power to secure justice, and we ask you to do the same. Please know, I truly appreciate your time and consideration and welcome a reply from you in the very near future. Sharon Cooper is one of four sisters of Sandra Bland. A native Chicagoan, Cooper is a DePaul University alumna and works as a human resources professional at a Fortune 250 company. In the wake of her sister’s untimely death and the extraordinary and suspicious circumstances surrounding it, Cooper’s dedication to social change has been heightened. She is married to her college sweetheart, and they have a 3-year-old who’s full of personality.